Cove Rangers defender Alan Redford believes Cowenbeath will struggle to deal with his side’s attacking threat. The Highland League champions scored 127 goals in 34 games on their way to the title and defeated their Lowland League counterparts Spartans 5-2 on aggregate to set up today’s showdown with the Blue Brazil. Redford feels there is no reason for Cove to be fearful when they take on Gary Bollan’s side at Harlaw Park, Inverurie, this afternoon in the first leg of the SPFL pyramid play-off final, with the second leg in Fife next Saturday. The 38-year-old said: “We will set up like we always do. “If any team scores against us we always feel we can score more. “That is what we have been doing all season. “I don’t know too much about Cowdenbeath but our manager John Sheran will have had them watched and be prepared for them. The former Huntly fullback added: “We were able to get the first part of the job done at Spartans on Tuesday. “We could have scored a couple of goals in the first half. “I think we may have relaxed a little bit too much after Paul McManus fired us ahead in the second half. Perhaps we felt the tie was over but they came back at us and they put us under a bit of pressure to win 2-1 n the night. Cowdenbeath defender Bryan Gilfillan has enlisted the help of Buckie Thistle manager Graeme Stewart ahead of today’s tie. Gilfillan, formerly of Peterhead, played alongside Stewart during his time at Caley Thistle. 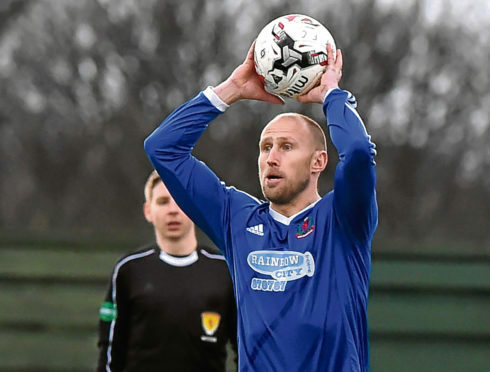 The 33-year-old said: “I stayed up at Graeme’s house last weekend and took the opportunity to pick his brains about Cove Rangers to find out about their dangerous players that we should be looking out for. “Graeme is obviously very knowledgeable about the game and it was great to get that insight as he knows Cove really well. “We also watched the Press and Journal’s footage of Cove’s play-off win over Spartans so I think we know their strengths and weaknesses. “Cove are a very experienced team. I know a few of the guys such as Scott Ross and Ryan Strachan from my time with Peterhead. “I’ve also played against Paul McManus and Mitch Megginson during my time in the SPFL.